Office 365 Environments: If you whitelisted our email servers prior to February 2018, you will need to add an additional mail flow rule in your Office 365 Admin center. This rule can be found in the Bypassing the Junk Folder section of this article. 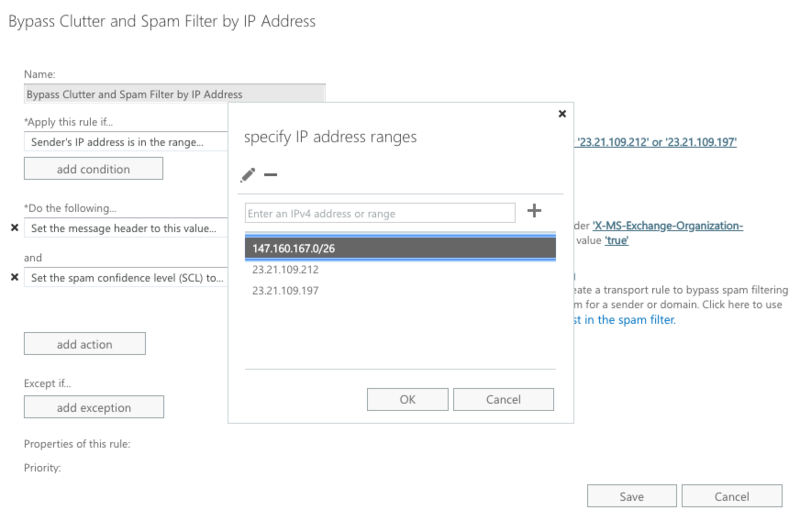 This article will cover how to whitelist our simulated phishing email servers in your Exchange 2013, 2016, or Office 365 environment (the process is the same for all three mail servers). 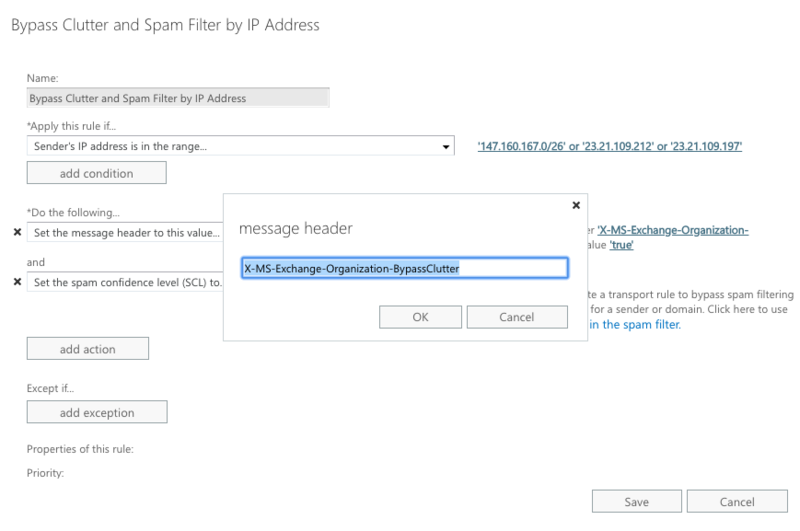 The goal is to allow us to send simulated phishing emails to bypass your Microsoft Exchange Online Protection (EOP) mail filter. This setup will allow only simulated phishing emails from us to bypass this filter. First, you'll want to set up an IP Allow List which includes our three IP addresses. Next, you will set up a mail flow rule to allow incoming mail to bypass both the Clutter folder, as well as Microsoft's EOP spam filter. You must do BOTH to whitelist successfully. Once your settings are in place, it may take some time for those settings to propagate. We recommend that you wait 1-2 hours and then set up a phishing campaign to yourself or a small group to test out your new whitelisting rules. 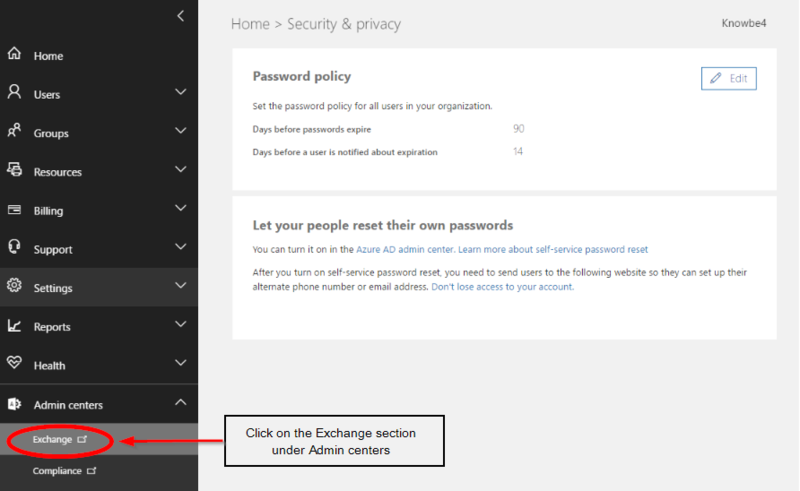 The instructions for setting up these rules are shown below (the below instructions show screenshots for Office 365). Alternatively, you can watch our video on whitelisting by IP address in Office 365 here. Log into your mail server admin portal and click Admin. Click on connection filter (beneath protection heading). 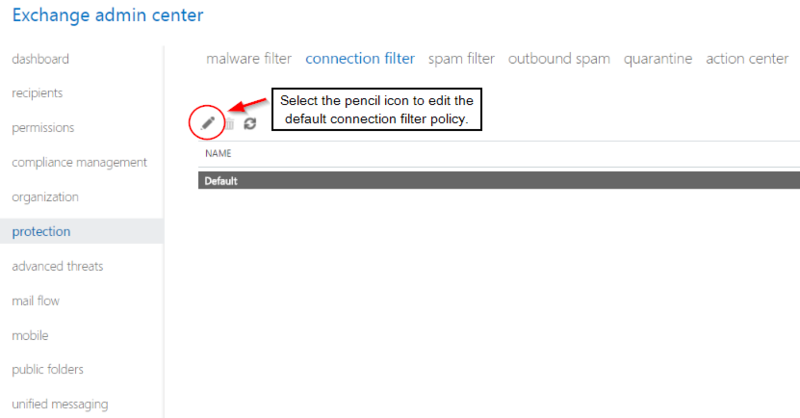 Click on connection filter, then click the Pencil icon to edit the default connection filter policy. 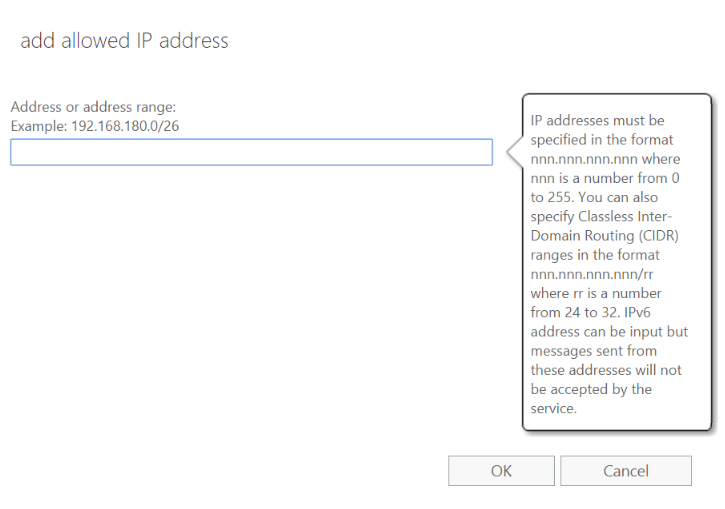 Under the IP Allow list, click the + sign to add an IP address. Click OK, then Save. 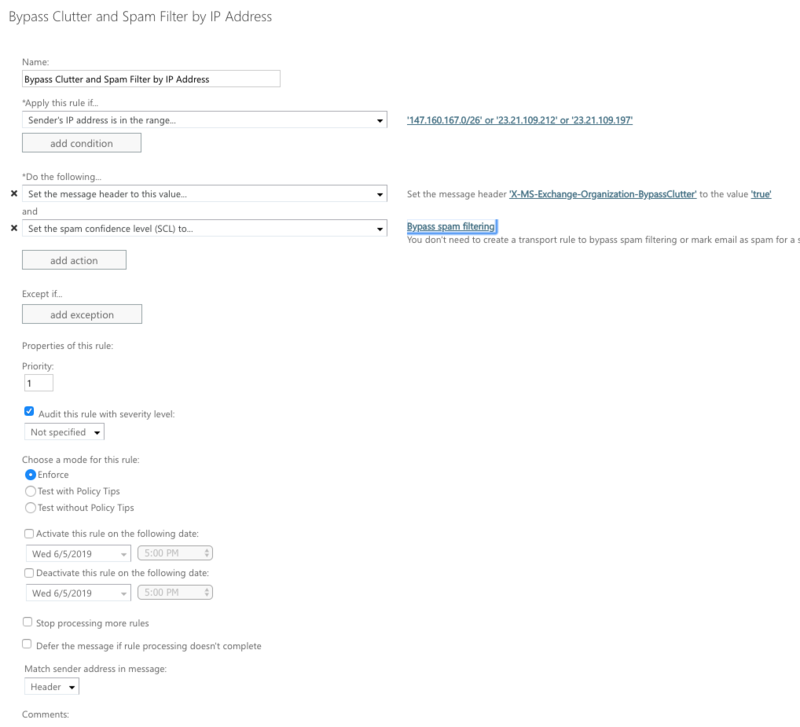 Next, you will want to set up a mail flow rule to allow our mail to bypass spam filtering and the Clutter folder. 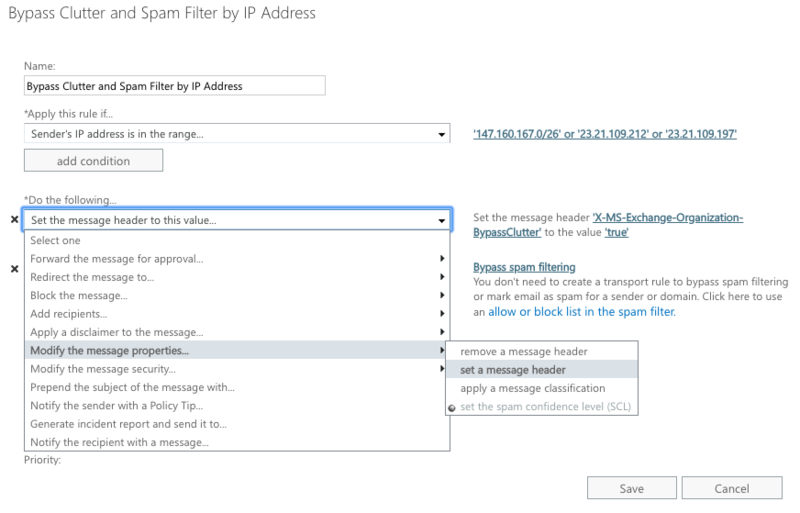 To ensure our messages will bypass your Clutter folder as well as spam filtering within Microsoft's EOP, you can follow the steps below. Give the rule a name, such as "Bypass Clutter & Spam Filtering by IP Address". 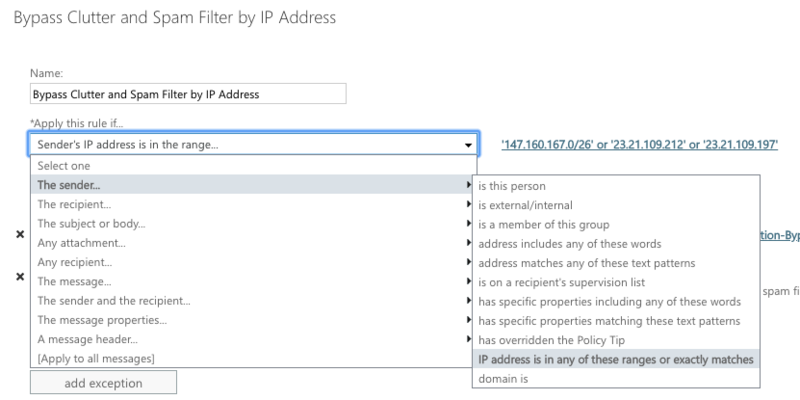 Select The sender, then click on More Options and select IP address is in any of these ranges or exactly matches. Don't see the settings you need? Make sure you click the More options link on the New Rule screen to be able to see all the settings you need. Set the message header "X-MS-Exchange-Organization-BypassClutter" to the value "true". Both "X-MS-Exchange-Organization-BypassClutter" and "true" are case sensitive. Add an additional action beneath Do the following to Modify the message properties. 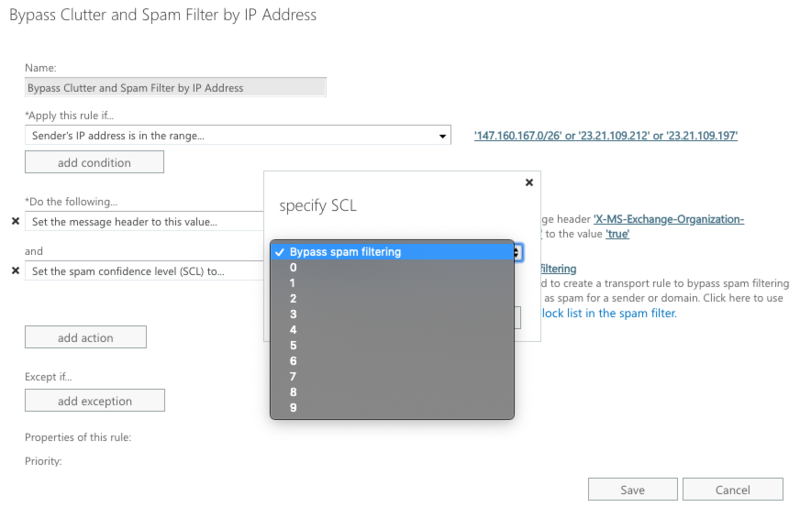 Here, click on Set the spam confidence level (SCL) to... and select Bypass Spam Filtering. To test out your whitelisting and make sure phishing security tests will reach your end users, you can set up a phishing campaign to a small test group which includes yourself. Once the simulated phishing email reaches your inbox, you'll know you've successfully whitelisted our servers in your system. 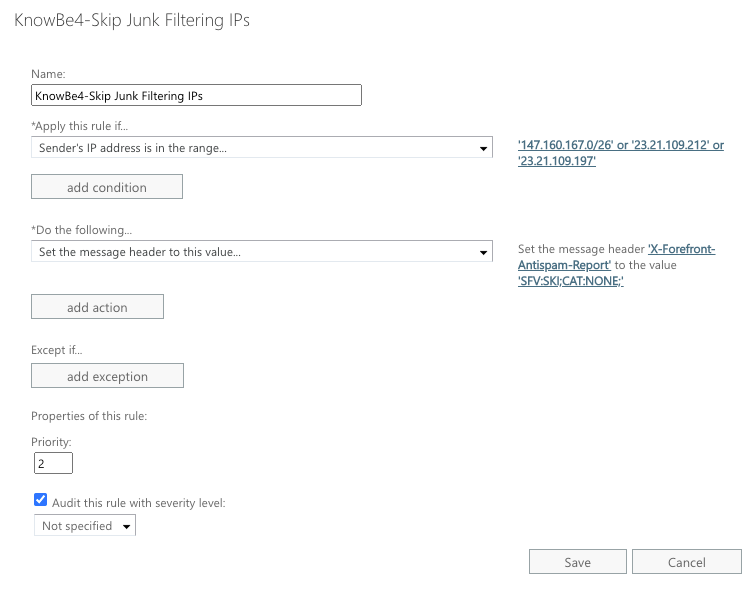 Give the rule a name, such as "KnowBe4-Skip Junk Filtering". Set the message header "X-Forefront-Antispam-Report" to the value "SFV:SKI;". Beneath Properties of this rule set the priority to directly follow the existing rule (outlined in Bypassing Clutter and Spam Filtering) set up for KnowBe4 whitelisting.